TRUE, TRUE, TRUE ! ! ! if your words only rang in mick's ears . . .
(. . .) And for those who prefer a "real" book rather than the current e-book format of "A Love That Burns", I've heard that one is in the works. Apparently there's a lot of hassle involved in reformatting everything for this, but hopefully the paper-and-ink version will be available in a few months. any more new / detailed info on the possibility of a print version of rich's book? i'm still curious to know . . . ! I know that Rich has been working on it - apparently the reformatting necessary for a print edition has been time-consuming. Hopefully it will be ready sometime this summer but we'll have to see how things work out. thanks very much, sharky - please keep me posted when things are getting "serious" . . . ! Too bad I hadn't seen this, it could have been interesting, has anyone watched it? 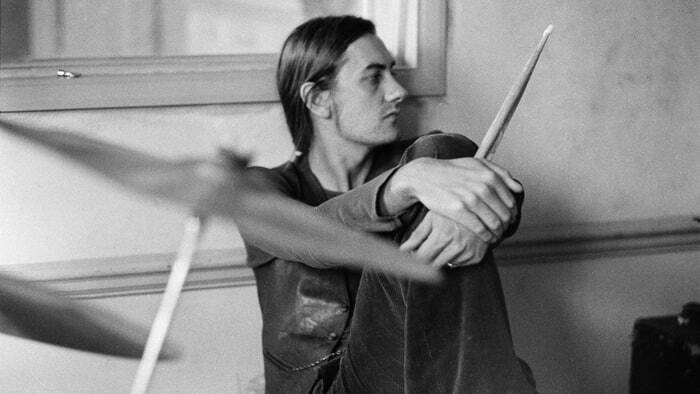 Mick Fleetwood is joining Rolling Stone contributing editor Anthony DeCurtis for a wide-ranging conversation about early Fleetwood Mac history – including the unique talents of original guitarist Peter Green, the band's first international tours, their wildest onstage moments and the friendships that propelled the pre-Rumours line-up to international fame. Fans can livestream the discussion, currently taking place at New york City's 92nd Street Y, above. The chat promotes Fleetwood's upcoming book, Love that Burns – A Chronicle of Fleetwood Mac Volume One: 1967-1974, which is available for pre-order via Genesis Publications in two formats: a deluxe edition (numbered one to 350) and collector edition (numbered 351 to 2,000). Both versions include a seven-inch picture disc featuring "Love That Burns" and rare instrumental track "Fleetwood Mac," along with 400-plus rare photos, memorabilia and illustrations. The deluxe edition includes two prints, one signed by blues legend John Mayall and another by graphic designer Günther Kieser. Previous pre-orders of Love That Burns included a free ticket to today's discussion, along with a commemorative bookplate signed by Fleetwood in person before he took the stage. Fleetwood Mac recently headlined the all-star, bi-coastal Classic East and Classic West festivals. Two of the band's songwriters, Lindsey Buckingham and Christine McVie issued their first collaborative LP, in June. This Sunday, August 13th, marks the 50th anniversary of Fleetwood Mac. On that date in 1967, the band played their first ever show, alongside artists like Cream and Jeff Beck, at the Windsor Jazz & Blues Festival. But according to drummer Mick Fleetwood, even with their massive success in the years since, much of Fleetwood Mac's early history remains unknown to everyday fans, many of whom quite likely believe the band to have begun life in the mid-Seventies, with Lindsey Buckingham and Stevie Nicks at the helm. The drummer intends to shine a light on his band's oft-ignored formative years as a crack British blues outfit with a new book, Love That Burns: A Chronicle of Fleetwood Mac, Volume One 1967–1974, due September 19th from Genesis Publications. "It's about giving kudos to the founding fathers of a very strange journey that Fleetwood Mac ended up taking over the course of all these years," he tells Rolling Stone. Those founding fathers include the founding father of Fleetwood Mac, guitarist and vocalist Peter Green, who formed the band with Fleetwood (the initial lineup was rounded out by guitarist Jeremy Spencer and bassist Bob Brunning; John McVie, the "Mac" in Fleetwood Mac, replaced Brunning not long after the Windsor gig) following a stint in John Mayall's Bluesbreakers. They soon welcomed a third guitarist, Danny Kirwan, and achieved success in the U.K. with Green-penned songs like "Black Magic Woman," "Albatross" and "Oh Well." Over the next few years, the band cycled through members and musical styles; Green, Spencer and Kirwan each exited under unusual circumstances, among them psychological and emotional struggles exacerbated by drug and alcohol abuse, while later members like guitarists Bob Welch and Bob Weston and keyboardist and vocalist Christine McVie – who remains with Mac to this day – came in and helped to lead the band down new sonic paths. In late 1974, Fleetwood and the McVies were joined by Buckingham and Nicks, which is the point at which Love That Burns concludes. "That's why it's called Volume One," Fleetwood says. "And hopefully there will be a Volume Two that will pick up from there. But I wanted this to be a separate story, because it is an important story in its own right." In Love That Burns, this story is afforded a gorgeous presentation. Fleetwood's insightful and sometimes humorous first-person account of the band's origins is fleshed out by more than 400 stunning (and in some cases never-before-published) images, as well as intimate archival material and rare memorabilia. There are also additional recollections from those close to the band at the time, including John Mayall and early Mac members Jeremy Spencer, Christine McVie, John McVie and the rarely-heard-from Peter Green himself. It's all gathered together in an exquisitely produced large-format tome that is limited to just 2,000 copies, each one signed by Fleetwood himself. "A lot of care and a lot of love went into this, and I give kudos to Genesis for that," Fleetwood says. "They don't do it unless it's done right. And there aren't hundreds of thousands of these books that are going to be made. So it really is a labor of love that something like this gets to exist, and it also is great to know that this story can be told, and anybody who has an interest in it can now know about it. "To me, selfishly, that was an important thing," Fleetwood continues. "Because you know, at some point in the next few years Fleetwood Mac will bonk it on the head. We probably won't be active. So there is some relevance to starting to tell this story. And this book, as with any type of chronicle, contains all of those potions of magic moments, of sad moments, all the moments that unfold when you're doing something like this. It's like going through an old family album. It's been a trip, and I'm so glad we've done it. And I hope we've done it beautifully." With Love That Burns you clearly want to bring attention to the early history of Fleetwood Mac, a period that, at least in America, isn't very well known. No doubt. I'm hoping this tells exactly that story, and that's why the book is dedicated to Peter Green, who started the band with me in 1967. He is the reason I'm here and the reason there is a band called Fleetwood Mac. So all of that is pregnant with having put this book together. And the hope is that someone who doesn't know that story will read about it here and they'll find it quite intriguing. And Genesis Publications, you know, they're certainly up there in that special area where there are only a few publishers that do books like this. In this day and age, it's sort of refreshing, to be quite candid. I almost don't know how any of that type of approach is even surviving anywhere on this planet right now, where it's all this "here today, gone tomorrow" mentality. What we've done is an art book, really. There are so many spectacular photos in the book. Tracking down and sorting through all the images, and likely coming across many that you hadn't seen in a long time, if ever, must have been pretty intense. 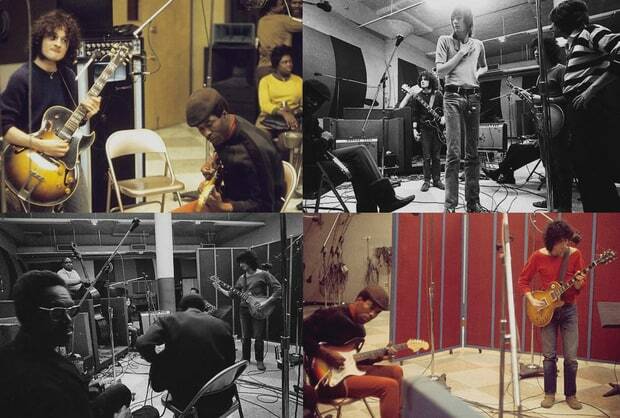 Fleetwood Mac recording 'Blues Jam at Chess Records' with Buddy Guy, David "Honeyboy" Edwards and Walter "Shakey" Horton, 1969. Those photos are particularly striking. We paid quite a lot of attention to that section. Because at the very beginning we were a bunch of kids that just loved playing blues, and we were blessed with being able to go to Chess. And that strongly resonates in those pictures. You know, I don't think about it every day, but to realize, there we were, Peter [Green], Jeremy [Spencer], Danny [Kirwan], John [McVie] and myself, with Willie Dixon and Buddy Guy and Shakey Horton and a bunch of other great dudes, that's a powerful ... that's probably the most powerful part of what I think this book is. For someone who knows nothing about this band it tells you a lot. It's like, "Wow, I never knew that!" But we were a blues band. This is what started Fleetwood Mac. 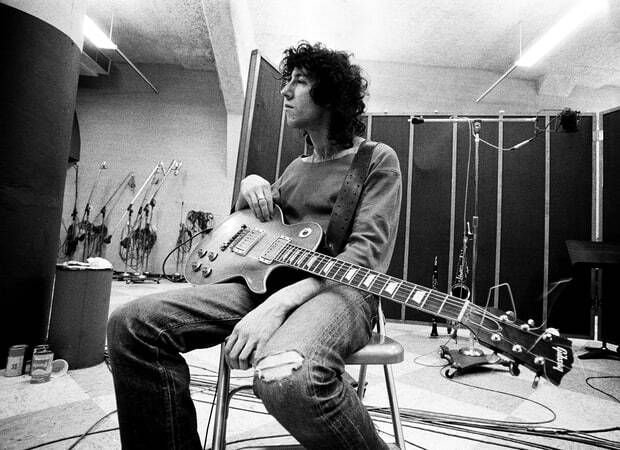 "Love That Burns" is a Fleetwood Mac song from the Peter Green era. Why did you choose to use it as the title of the book? We came with different ideas for titles and I suddenly went, "'Love That Burns.' ..." It seemed so relevant to the whole story of Fleetwood Mac. It's a beautiful song that Peter sang and played and has always been one of my favorites. And when I spoke to Peter, I will never forget what he said to me. I don't talk to him every day, and his life took a turn that in a way took him out of my life, sadly. He's not the Peter that I originally knew. He's OK ... but he's not OK, you know? A bit of both. But we got on the phone, and one part of our conversation, I said to him, "We knew each other, we played with John Mayall, we played in a band before that. But, Peter, why did you ask me to be at your side playing drums [in what became Fleetwood Mac]?" Because after John Mayall, Peter was almost forced to put a band together by a bunch of agent thugs. He was sort of told, "You're like the new Eric Clapton," or whatever all those corny phrases were. But he just wanted to go to Morocco and hang out like Brian Jones, you know? And of course that didn't happen. So he asked me to join him. And probably somewhere in there I was thinking to myself, "Well, you had the chops and you could play the blues ... you were the man!" And it was nothing of the sort. After I'd asked the question, Peter said, "Yeah, you were really unhappy, Mick." He said, "Think about it. You'd just broken up with Jenny" – my first love, who I later married and had two lovely children with – "and you were so sad, Mick. And lost. I just thought you needed to do something." And of course, it was true! That, to me, is "Love That Burns," you know? It wasn't about the music. It was about, he was my friend. I thought that was really powerful and extremely moving. In addition to all the photos, there are some great first-person interviews and recollections in the book. Absolutely. Think of me sitting with John Mayall. If it hadn't been for John Mayall, you go, "Wow, maybe none of this would have happened." You know, John [McVie], Peter and myself were all in John Mayall's Bluesbreakers. And, by the way, people always assume that we all sort of left John Mayall to form Fleetwood Mac. It was nothing of the sort. I got fired from John Mayall's band for being too drunk and all that. 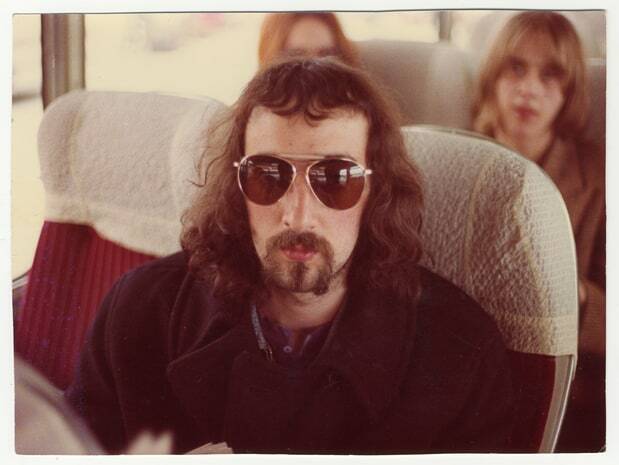 John [McVie] stayed with John Mayall, and Peter formed with me the beginnings of Fleetwood Mac. Then John came with us, and Jeremy [Spencer] and later on Danny [Kirwan] came in. It's a fascinating story. And to sit there talking with John Mayall, and get his slant on what was happening ... it was like sitting with an old college mate or a childhood friend. When you get together you go, "Oh, my God! Of course! That's what happened!" As the book touches on, Peter, Jeremy and Danny each exited Fleetwood Mac while dealing with mental and emotional issues. It must give you pause to have witnessed this happen with three vital band members. Do you ever wonder what might have caused this, or do you chalk it up to coincidence? Well, I hope to God it is coincidence, or me and John [McVie] need to go to a church and get down on our knees and pray for forgiveness! But if you look at what happened later [with Stevie Nicks and Lindsey Buckingham], which is not part of this book, that's pretty bizarre too, you know? The latter-day stories of Fleetwood Mac, that in truth continue to this day, you look at that and you think, "How the hell can any of this survive?" So I don't know how to address that other than that it's heartbreaking and you have to get over it. You have to let go of it. And so this book is about paying kudos to who these people are and not getting into the drama of what we're talking about now. I did not want that to be in there. And it's not in there. Rather, it's all about the special part of what everyone had to offer. But you're right, it has been a reminder of what happened. Talking to Danny [Kirwan]'s ex-wife ... you know, it's not a happy story for Danny. And there's nothing one can do about it. But I think it's even more of a reminder to pick your trousers up, brush yourself off and say, "But look at the amazing music Danny put together. Look at what he put into Fleetwood Mac." This guy was extraordinarily talented. So the hope was to celebrate all these players that have come through Fleetwood Mac. These are the founding fathers of this band. Peter and Jeremy were both interviewed for the book, but Danny's voice is absent. Was there an attempt to reach out to him? There was. And he ... his wife did it. Claire did it. There has been talk over the years of a reunion of the original Fleetwood Mac. Is that something you still hold out hope might happen one day? It's actually not. Mainly because I went there many years ago. We got into it and we were going to put a whole thing together at the [Royal] Albert Hall. This is years and years and years ago. Probably about 15 years ago. And right at the last minute, Peter, in the world that he lives in, just suddenly pulled out. "I don't wanna do it. ..." Suddenly it was not a good idea. And we had put a whole bunch of things together, I had even booked the venue. So I would never do that again. Because I don't want it to be a pressure, you know? Having said that, my dream with this book coming out, and I'm working really hard, is that there will be a lovely show where a few people that mean a damn can come out and pay quiet kudos and tribute to Peter. Maybe we could pull off a short tour in England, or something like that. That would be my dream. As much as Love That Burns is a tribute to Peter, one thing that also comes across in the pages is how much reverence you have for another of your bandmates, John McVie. Which is illuminating, as we don't hear much from him or about him. He tends to stay in the shadows. That's how he likes it [laughs]. You're giving him the recognition he doesn't seem to be so concerned with garnering for himself. Very much so. He's my dearest friend. He's ... he's Johnny Mac. And you're right. He's very understated. But my hope is that John would celebrate all the things this book represents. Because it's his story, too. We've been there the whole time, for 50 years. John is my partner. And we huff and puff and do our thing, but I hope when he opens this book that he's really pleased with it. If this ends up on his desk in his office, not relegated to the dustbin, I'll be happy [laughs]. It's been 50 years since Fleetwood Mac began. Is it amazing to you to look back and realize it's lasted this long? It is. And this book has become like an old friend, really, where it's triggered all sorts of things. I just turned 70, and during this process, it gave me huge pause about from whence I have come. It must, unless you're completely insensitive. And in truth I'm probably, as John would say, too much of a drama queen. Indulging in too much sort of Irish bursting into tears and stuff [laughs]. But I'm happy to be that person. And certainly, this book, I don't like to live in the past, but it's been really useful for me, and I am proud of the fact that there has been and is a band called Fleetwood Mac. Because at the beginning we were this funny bunch of English kids, amongst many others, that ostensibly had a love for a genre of music that really no one gave a **** about. And we were part of this group of bands that really had such a huge effect – certainly, at that point in time, a way bigger effect than us bunch. Bands like Eric [Clapton] and Cream, Led Zeppelin, the Yardbirds, the Rolling Stones. But this is our story. And the band changed so much. If you look at the Rolling Stones – and it's just a "for instance," no comparison – they're always the Rolling Stones. But if you look at Fleetwood Mac, it's like, "Wow, they did that? And then they became this?" It's a pretty unique story. It's not like the band stayed the same. The style changed. The people changed. Me and John have hung in there since the beginning, but it's a lot different. And Bob Welch, Bob Weston, all the others that were there, they're all mentioned in this book. And rightly so. They're all part of this story right up to when Stevie and Lindsey joined. And that's where the book cuts off. Because it's about what came before. And you know, the ups and downs of any band, the good and the bad of it, that is not unique property for really anyone, when it comes down to it. But the actual variety of what happened to Fleetwood Mac? That is quite unique. That is powerfully unique. And to know how that funny story started is what Love That Burns is all about. I just wish that Mick would make his book available to more than a relative handful of folks wealthy enough to pay the $400+ for a copy. I have a few beautifully-produced photo books that cost in the $50-60 range - for something like this, that's a price I'd certainly pay. I'm sure that to bring down the cost to a more reasonable amount would involve some compromises in the book production/format from the limited edition being put on sale next month, but it would have the potential to reach far more people. You're welcome, and you're right, for once Mick's marketing strategies (well, those of the ones who work for him) are actually functional and it's a shame that they are for a project who concerns only a rather small portion of the FM fandom. The fact is that Fleetwood Mac, unlike many other of their peers, still lack a definitive biography official and Mick's books may be the closest we'll ever have to it. For many, the story of Fleetwood Mac begins with the 1974 arrival of Lindsay Buckingham and Stevie Nicks, the talented yet combustible American duo who ignited an explosive string of hits that continue to define the band. But Mick Fleetwood wants to move past those rumors. Fans of the group’s pop jewels would hardly recognize their original incarnation as one of the most respected British blues bands of the ’60s. Now the founding drummer is telling the tale of those formative years in Love That Burns: A Chronicle of Fleetwood Mac, Volume One 1967–1974, a lavish new book by Genesis Publications due out Sept. 19. Featuring never-before-scene photos, insightful interviews from band members and intimates, and even a vinyl 7-inch of rare early recordings, it brings this often forgotten chapter of Fleetwood Mac’s history to life. In what would become something of a recurring theme in their career, serious interpersonal problems soon threatened to tear the group apart from within. By the dawn of the ’70s, Green and Kirwan departed due to struggles with mental illness exacerbated by drug use, while Spencer parted ways with the group following a religious conversion. With the abdication of their primary creative forces, Fleetwood and McVie soldiered on with guitarists Bob Welch and Bob Weston, as well as the multi-talented Christine McVie, who happened to be married to the bassist. Fittingly, Love That Burns closes with an image of the El Carmen, a Mexican eatery in Los Angeles where Fleetwood and the McVies held an “audition” over dinner with Buckingham and Nicks. But that’s a different book. Fleetwood spoke to PEOPLE about those early days in the Swinging Sixties, reconnecting with his past, and the friendship that formed the heart and soul of one of the biggest bands in rock history. Over the years you’ve become the unofficial archivist of the band. Was there a point when you made a conscious decision to hold onto things for the sake of history? If ever there’s a Volume Two, I’m very well prepared for that. I used to get ribbed even back in the day with the other band members. “What are you taking the pictures for, Fleetwood?” I’d go, “Hang on a sec!” They would just be snapshots of stuff, so I’ve done that. My father loved taking pictures so to that extent, I had something that was relevant. But we’ve ended up trying to tell a story about this strange band from whence we have come. And that starts with 1967, 50 years since we’ve done our first show at the Windsor Jazz Festival. The book is a perfect way to mark the anniversary. Was that the intent all along? The fact that we ended up doing it with Genesis is really a story in itself that goes back many, many years when I saw a book they did with George Harrison [1980’s I Me Mine] which was gorgeous and stunning and meaningful. It was a fantasy that one day…. [laughs] Then it sort of went off the radar. But it came back a couple of years ago when I was in a shop in LA and I saw a book they had done with Jimmy Page from Led Zeppelin [Jimmy Page by Jimmy Page]. We opened it up and said, “There it is! It’s them guys again!” We called the book company up and said, “Would you be interested?” And we’ve ended up here two years later. It’s a document that is driven by pictorial images for the most part, with some editorial. I’ve done an autobiography and in many ways this gets to the point quicker. There are so many things that came out as images, you had to very selective in the end result. It has to then tell the story. And that’s what we’ve tried to do, and I’m really happy and proud. It’s a trip. It’s appropriate that it’s 50 years of Fleetwood Mac, but that wasn’t part of the plan. It just inadvertently … “Oh my God!” We just took our time doing it and realized, “Wow, it’s coming out when we’re 50 years old as a band.” So it became even more poignant and more relevant as a document. This book is mostly focused on how we started, as it should be. But in terms of an incredible collage of different moments, and an unbelievable amount of different styles, with Bob Welch and Christine [McVie] joining and Jeremy [Spencer] and Danny [Kirwan] taking over when Peter [Green] left. It’s all featured in this book right up to the moment that Lindsay [Buckingham] and Stevie [Nicks] joined. Me and John were always banging away there, which I think helped bring some kind of continuity to it, but it is an unusual story. I hope that someone picking this [book] up will go, “Wow, what was that? Kiln House? Never heard of it!” That’s an important part of this document, and I do consider it a document that is part of something before it might go off the radar. There’s no doubt, rightly so, that the present day incarnation of Fleetwood Mac is doubtless going to be remembered as, “That was Fleetwood Mac.” This is understandably never going to be that, but it’s nice to know that bits and pieces that might find this period interesting. I’m glad that I’m connecting to this document. The start of the book reads almost like a Dickens story: you come to London at age 15 and immediately meet David Hockney and the Beatles, and have your hair cut by Vidal Sassoon. Was it as incredible at the time as it seems now? Well, in a different way. Anyone who was in London then witnessed, and in some ways was involved in, a whole movement in fashion, music, and art that pushed away what the Second World War had done. It was real, and it’s still here. The tentacles of what happened were that powerful, especially in music. The game has not played out. Those guys like the Beatles and the Rolling Stones are still relevant. I blundered into being around the Beatles because I was going out with Jenny [Boyd], and of course she was Pattie’s sister who was going out with George. All of that extra stuff became more relevant looking back. Now I go, “Wow!” At the time I thought, “Oh, this is cool …. Whatever.” I was just a struggling player. But what was relevant then was this band of players that I was around, ostensibly the original four—and then five—members of Fleetwood Mac, with Danny [Kirwan] joining quite soon after we started. We were just ensconced and focused on what we were doing. We had no idea it was going to be attached to what was going on in London. It wasn’t very fashionable. It wasn’t pop music. We were living out our dream following our blues train down the rails, and then it became part of something very relevant. We were very authentic about what we were doing. You had trailblazers; the Rolling Stones came from that world, and very quickly morphed into skilled songwriters. The Yardbirds were before us bunch, too. We came and really emulated Elmore James and early Delta Blues stuff that reflected in those early recordings. And then we took our journey that was led by Peter Green with “Oh Well” and “Rattlesnake Shake,” and “Albatross,” and all the weird songs that came out of the period were all represented in our story. It’s funny when you think of everything to come, but I understand you weren’t a big fan when you first heard Peter play. That’s one of my confessions, considering he’s my favorite guitar player and in many ways mentored me and gave me my self-worth as a player. I always say that I was a guy who happened to play drums versus “a drummer that found himself.” I just lucked out. When I first heard Peter, he auditioned for a band called the Peter B’s Looners with Peter Bardens, who was the guy who knocked on my door and started my journey as a drummer. He said, “I heard you playing in the garage!” It was like one of those fairy tales. The whole thing has been a bit like that. In an interview in the book, John McVie talks of you cementing your friendship on a bumpy flight to London from Dublin during an early gig with John Mayall’s Bluesbreakers. What are your memories of that trip? You are well-informed! Freesias! That’s a longstanding joke. Occasionally John will get a collage of freesias, the sweet-smelling flowers. On that flight, for some reason I turned up at that airport [with them]. I was thanking him for something and I said, “I have something for you.” And John’s very upright. Very different from me, I’m an old drama queen. He’s like, “I don’t understand how you can wear pink socks!” or whatever. I got into that a little bit, but he was very straightforward. So I turn up with the flowers and he’s like, “What’s all this about?” And it became this longstanding joke. So now from time to time he’ll get some freesias. And he gets it, hence him saying that. It was me reaching out. He became very much a supportive [force]. When I first joined John Mayall’s Bluesbreakers, I took over from a very, very, very talented drummer called Aynsley Dunbar. He was a genius drummer, like John Bonham. And I’m going, “I don’t understand why he’s moving on.” The reality was that he was so clever, it got to a point where he was too complicated to be playing [the blues] and John Mayall made the decision that he wanted to change. And Peter phoned me up and said, “I got you the gig in John Mayall’s.” I was painting walls at the time, and I’m going, “Why would you be getting rid of this genius drummer?” Aynsley had a huge following. In those days people would come and cheer, “Aynsley Dunbar!” “Mick Taylor!” “Eric Clapton!” “Peter Green!” It was hero-worshipping at these pubs and clubs where we used to play. It was a whole thing in London. We used to follow people and cheer for them. So I’m suddenly there and not Aynsley. He did this incredible drum solo, and I couldn’t cut that sort of mustard at all. At one of my first gigs there were some hecklers in the back of this little theater saying, “Where’s Aynsley.” And I’ll always remember, John McVie came up to the mic, holding his Fender Jazz bass as if to say, “Any more of that s— and you’re going to get this wrapped around your neck!” I was always very grateful. John’s very not forward onstage, it was probably one of the few times he would come up to a microphone to say “Hello” or “Goodnight,” or anything. John is … John. But he went straight up to the mic and said, “If you don’t give this guy a f—ing chance…” and told them all to shut up. And they did! That was my first or second show I ever did with him. I remain grateful—hence he gets the flowers. You mention Delta Blues and Elmore James forming the bedrock of the music you played with John Mayall and later with Peter Green in early Fleetwood Mac. What was it like having the opportunity to play in the actual Chess studios with people like Willie Dixon and Buddy Guy? It was extreme. That’s a very powerful moment. Fleetwood Mac was playing with our heroes. It was much to the credit of Mike Vernon, of our little record label, Blue Horizon. He went to see all of these blues shows in England and, I suspect, knew Willie Dixon—or at least how to get to him—and he arranged that whole thing. “You mean we’re going to Chicago and making an album with all of these guys that Willie Dixon put together? What do you mean?! Oh wow, Chess Records!” We’d be like little kids listening to that stuff back in the day, even before Fleetwood Mac, so it was very important. We paid some real attention to that moment in the book; I’m glad you brought that up. It amplifies the very nuts and bolts of what this was all about. We were a blues band, a bunch of kids that played the blues and aspired to as good as we could, and we were blessed as a band with Peter Green and Jeremy Spencer. In the beginning, if you listen to Elmore James and put Jeremy on, he was Elmore James. He became not just a copyist, but he actually lived somehow that style of slide playing. I remember Peter went down to a place where, quite frankly, white folks didn’t go. Willie Dixon took him down to one of the blues clubs and Peter apparently got up and played, and everyone’s looking him down. There were no white folks in there, and I was told by one of our road managers who had gone down there that Peter cut the mustard. He was a magical, powerful player who resonated with people who were our heroes. So the whole trip to Chicago was extreme and certainly has a place in this book. What kept you going when Peter left? Was there ever a point when you wondered if you should pack it in? The first lesson was abject, extreme sadness. I just thought, “God, what are we going to do?” We rented a house from a friend of mine, which was Kiln House. It was a form of closing the ranks. We were very frightened. What was the formula for survival? I think, “We better close ranks or this is over.” Then that whole method of survival was probably repeated many times, which is why we’re still here. Part of the reason was always wanting to continue having a partnership with John and two or three other band members. So it was, “Let’s not throw this away. Let’s give this a go and see if we can keep going.” When you’re in a rhythm section and you don’t have someone to play with, what do you do? Play in your living room? And I’m not making light of it, but I’m giving a reason that I think was probably more important: “Let’s see if there’s a way to keep your job.” And that became a model that we never gave up. We were very blessed along the journey with people who were part of the survival, which eventually led to a major, major chapter in Fleetwood Mac that everyone knows about. But they don’t know about the period in these pages to that extent—and they never will. Some people who aren’t here—Bob Welch isn’t here anymore—but there are people and moments that should be accoladed, and this book is part of it. Fifty years down the road, it’s a few pages that needed to be seen. The book really gives its due to Peter Green, even down to the name The Love That Burns. How did you arrive at the title? I said, “Well, why did you ask me?” One would imagine it was something like, “Well you’re a pretty good drummer…” but it was totally nothing to do with music at all. He said, “Don’t you remember? You were really sad. That’s when you broke up with Jenny.” I eventually married her later on, but I was devastated. He said, “You were so sad. You had nothing to do and you needed to pull your socks up.” The point being, that is the power of what is encompassed on and off through the whole history of Fleetwood Mac. It’s a mass of fear and loathing and love. [Afterwards] I burst into tears because it was so moving. He said, “I was your friend.” Later on, in a comedic way I say, “S—, I thought it was because maybe I was a halfway decent drummer!” [laughs] But there’s a lot of charm to that, hence the title made even more sense because the truth is, for better or for worse, that is still going on. And that’s a whole other story.